A tale of desire and deception told on a fairy-tale landscape of arcane texts, herbal lore, visions and disasters at the hands of the powerful. Water Dark is a standalone novella that takes place in the world of Ealiron, and features Eaglin of Ostarin, a main character in the Chronicles of Ealiron. This novella is also included in Wizards, Woods and Gods, a collection of twelve dark fantasy tales exploring the mysteries of the Otherworld through tree and animal lore, magic, cosmos, love, war and mysticism. 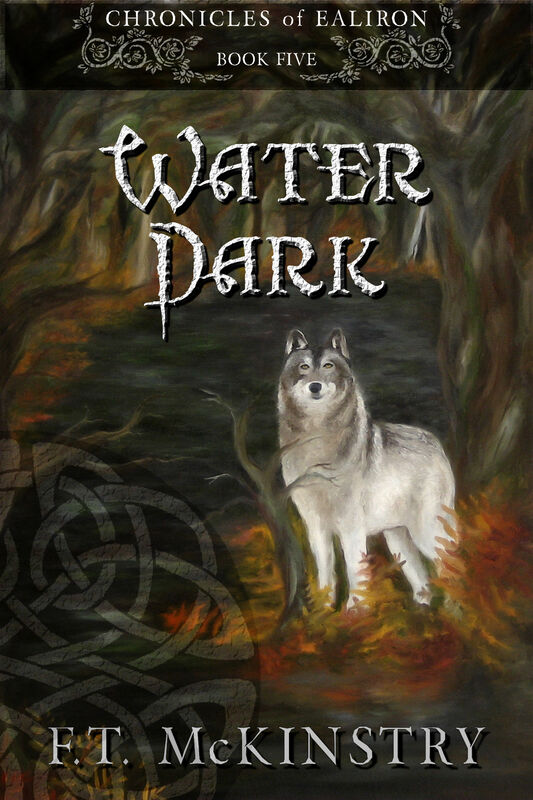 Water Dark was originally published by Wild Child Publishing, 2013. In the western-most crumbling halls of a mountain citadel lives a lonely wizard named Urien, a master of his art and a fledgling priest of a primordial goddess of transformation. Though his training is extensive, no training could prepare him for a broken heart. For years he has lived on the fringe after having loved and lost a powerful male wizard on the verge of ascension. But such wounds do not hide well. When he delves into the darker powers at the bidding of a shady priestess, Urien’s heart reveals itself as a grim warning from the goddess herself, in the shape of a wolf. In the wake of this unsettling experience, Urien discovers that his most gifted apprentice, a beautiful, wild-tempered woman—and the partner of his erstwhile lover—is in grave danger. A series of swift-moving mishaps including a second warning and a badly backfired protection spell lands Urien into a love triangle that exposes not only his deepest desires but also the black machinations of the priestess who deceived him. When she wields her full power against him, he must reconcile his heart in order to save his lovers and himself from isolation and death.